As a Rhode Island Wedding Photographer I have the good fortune to visit many of the beautiful wedding venues spread throughout the state. Certainly, there is a venue out there that is ideal for each couple on their special day – it might just take a bit of looking for them to find it. Here are a few useful tips on selecting your wedding venue. They are gathered from my many years as a Rhode Island Wedding Photographer. 1. Start the Search Early – The earlier the better, especially if you have your heart set on a popular venue. They tend to get booked out well in advance and you might find that the one you prefer is just simply not available for your special day. 2. Refine Your Search – Seriously discuss (and agree) together what size and style of wedding you want to have. Many venues will have an upper limit as the number of people they can accommodate. It is also to be expected that some venues will not suit particular themes, while others are more adaptable to exactly what you have in mind. 3. Check Out Photographers’ Portfolios – An expert Rhode Island Wedding Photographer, such as myself, will have a wealth of images from a wide variety of locations. Browsing through these pictures is a great way to pinpoint the type of (and perhaps, exact) location for your ceremony and reception. 3. Know Your Budget – How much are you willing to spend on the location? Be honest and be practical. Factor in whether or not the location provides tables, chairs, linen or any form of decoration. Some locations will act as your caterer, others will have a list of caterers they normally work with and some will require that you make all provision on your own. 4. Make a Visit and Be Flexible – Perhaps, you had a particular color scheme in mind but upon visiting the venue you realize what a distracting contrast it would make with the colors already on-site. (Another good reason to begin the venue search early!) Something like that may require that you rethink or at least tweak your chosen colors – or go with a different venue. Rhode Island has a wedding venue to suit every size, theme and budget a couple might have in mind for their ceremony and reception. There are hotels, country clubs, museums and garden settings all running the gamut from rustic to upscale, from hipster to historic. Here’s a close-up of a few of the lovely places available for your Rhode Island wedding celebrations. Diamond Hill Vineyards – This is a family owned property consisting of more than 30 acres of vineyards and on-site brewing of wines. They grow exquisite pinot noir grapes from which they produce delectable wines. Diamond Hill Vineyards is also a producer of fruit wines, using apples, blueberries, cranberries and peaches among others. The picturesque grounds of Diamond Hill Vineyards is frequently selected by couples as the ideal location for an outdoor or tented wedding. Sweet Berry Farm – A quaint post-and-beam barn, exquisite apple orchards, and rolling fields await you and your guests at Sweet Berry Farm. The hundred-acre property has been in operation for decades and has evolved from growing a few crops to a wide range of produce. Sweet Berry Farm provides two distinctive locations to host weddings of all sizes. At all times, the colorfully verdant landscape provides the perfect natural backdrop to frame each and every photograph of the bridal party. Blithewold Mansion – Its extensive gardens are perhaps the most striking feature of this country place era estate. The century-old waterfront property provides picture perfect views in every direction, adding its awe-inspiring landscape to each precious wedding photo taken on the grounds. History pervades Blithewold Masion, Gardens and Arboretum, and that history enriches the wedding day of couples who choose this location as the place to begin their life’s journey together. Mount Hope Farm – The beautifully elegant Mount Hope Farm has earned recognition for its historical significance by being listed on the National Register of Historic Places. Its Gov. William Bradford House was built in 1745 and remains wonderfully preserved, functioning as a gracious bed-and-breakfast. The grounds are immaculately manicured and many-a bride and groom have chosen it as the ideal location for their nuptials. The Mount Hope Farm also remains a vibrant part of the way of life of the surrounding community through the weekly farmer’s market it hosts. Kinney Bungalow at Sunset Farm – Kinney Bungalow at Sunset Farm is an East Indian-designed bungalow which never fails to astound visitors with its 20-foot-high ceilings and cypress wood panel walls. It was built in 1899, its owner specifically intending for it to be used as an entertainment venue. That is how it has remained throughout the years – welcoming guests to functions of all sorts. Kinney Bungalow at Sunset Farm is now a preferred location for weddings. While many couples take advantage of Rhode Island’s historical mansions, some choose locations that have a subtler elegance. Having decided on a summer wedding, the couple pictured above chose to take advantage of the beautiful Rhode Island scenery. A tent reception allowed their guests to enjoy the summer evening outdoors, while they danced under glittering lights that had been strung across the ceiling. The most enchanting moments of the day came not from viewing the scenery of the wedding, but from the bride and groom. The happiness shared by the newlyweds was infectious. The pair could not take their eyes off each other and anyone watching them could see how much fun they have just being together. As an experienced Rhode Island Wedding Photographer I stayed alert for candid moments that showed the carefree, loving spirit that permeated the day. The above picture was one of those moments. 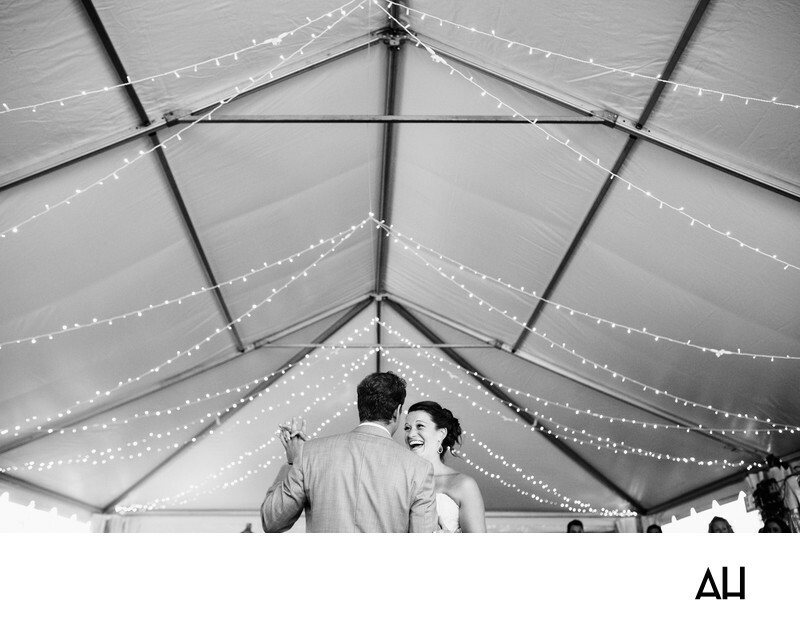 The bride’s face is the center of attention, resulting from the lights and lines of the tent. The image captures the pure delight she felt in dancing with her husband, freezing that instant of joy forever.